ChargeIt by Jay Divine Silver Glass Charger Plate 13"
Home > Products > ChargeIt by Jay Divine Silver Glass Charger Plate 13"
Provide a sophisticated and elegant backdrop for your upscale plates and platters with the ChargeIt by Jay Divine Silver Glass Charger Plate 13". 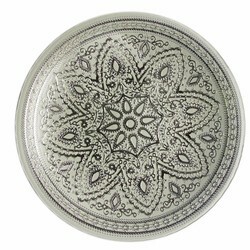 Beautifully accented with an intricate ornate embossing, this charming silver charger plate adds a timeless touch to any setting. Thanks to its high quality glass construction, this charger plate boasts superior craftsmanship that combines a delicate look with exceptional strength. Perfect for wedding receptions, engagement dinners, and fine dining restaurants, this charger plate not only complements any table setting but also protects against spills and mess. For proper care and maintenance, this charger plate must be hand washed only.